Looking for the courage to make a change? It's already inside you. There it is: the first yellow leaf! I had been watching and waiting for it to appear. Each fall, the leaves on the lush cherry tree in front of my house turn from verdant green to golden yellow. This year, the other trees in the neighborhood had already transformed themselves into a beautiful array of colors, but the cherry tree was stubbornly green. I wondered when my tree would know it was ready to change. Which leaf would have the courage to turn first? 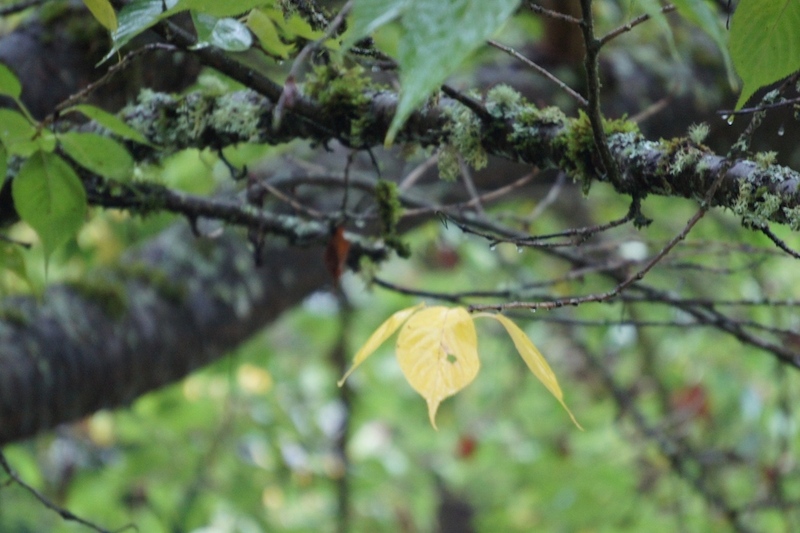 This morning, I noticed it: a confident yellow leaf surrounded by a tree full of green. I’ve always admired that pioneering leaf; how did it know it contained that power to transform itself? Those leaves remind me of the challenges many of us face. We may sense that our status quo is not sustainable, and that some kind of change is in order. But it’s difficult to abandon the comfort of those familiar green leaves to take on a new direction. We often think that the inspiration to make a change will announce itself in a loud, booming voice. We often look for a directive telling us “now is the time,” or for permission from others to step into the change we know we need to make. For me, the biggest and most profound changes have come more quietly. No fanfare, no announcement; just one step in a new direction. And then a second step, and a third, until I realized I was moving along my new path. Like that first yellow leaf, this new direction announced itself simply and quietly. As I continued along the path, my confidence built and my intention got louder. Soon it was as if my whole tree was covered in yellow leaves. I used to look at the glorious display of red, yellow, and orange leaves each autumn and think it was the trees’ grand finale. Now I see that the flourish of autumn color is just the beginning of the journey. A declaration of the change we are committing ourselves to, before the dark winter of introspection, exploration and discovery yields to our blossoming and transformation in the spring. Like the tree, we have to shed some of the old to make room for the new. What changes are lurking inside of you? What would it take to allow your first yellow leaf to emerge, to find the courage to take that initial, quiet step toward what you are seeking? Imagine how it will feel when you discover that the power to change was inside you the whole time. I'm a certified coach and former lawyer based in Portland, OR. I love helping lawyers and other professionals engage more fully in their professional lives. Learn more about me at www.SusanneAronowitz.com.